Who does not want to earn money today? And a business which is all yours can be a very good option to fill your pockets with a lot of cash. To set it up somewhere physically requires involvement of great finances and the risk of its flopping down is still always there. Grabbing a business opportunity online, without having to spend money, eluding the risk of failing down, is what you need to go for. Amazon is one such place that can help you set up your own virtual business environment and begin earning instantly. You can come up with products to sell on Amazon to people all over the world. Amazon has wide variety of saleable product categories among which you can choose one or more for you. Amazon is the most reputed and the largest online retailing platform. It keeps drawing a considerable number of consumers from all over the globe which makes this portal rank higher on list of budding as well as established enterprisers from everywhere. Sellers can join it and sell their products at good rates. Plus, registering yourself as a seller on this platform and then selling your goods to earn cash through it is not a difficult process either. It is rather easier to operate this than any other similar portal. 1. Go to amazon.com or your country amazon portal like amazon.in. Here i am using India website on amazon. 2. There on the top of the website, in the middle, you will notice many options. Click on ‘sell’ option. This page will appear. 4. This form will appear. Just fill in all the details correctly. Read their terms and conditions and then tick to agree to them. 5. Before continuing, keep the following documents ready with you. Your own bank details where you want to receive payments. If you decide to sell taxable products, then your taxation details (TIN no./VAT/CST) are also required. 6. Now, click on ‘Continue’. You will be asked to get your number verified. Enter your current mobile number where you can receive an OTP. And then click ‘Send SMS’. 7. 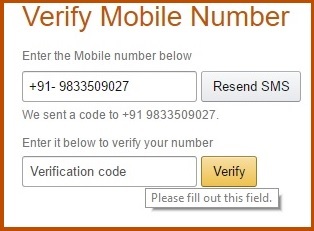 Now enter the verification code sent to you as an SMS by Amazon. Click ‘Verify’. 8. 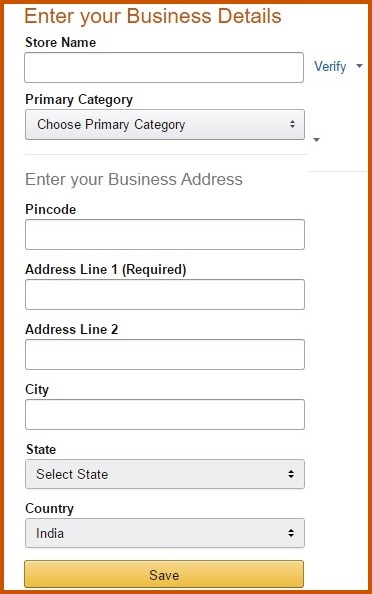 A form will display asking you for the details of your business that you want to run using Amazon. Fill every detail cautiously and then click ‘Save’ button. Once you click on save then it ask you to verify eligibility for shipping. 9. You can choose to avail Amazon Easy Ship service. Else, choose to ship products using your own courier.then Click ‘Next’. 10. You reach onto the last step of your registration. 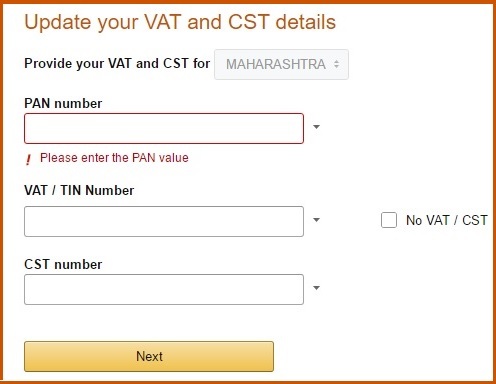 A form will show up asking you to fill in your VAT and CST details. Fill all of these carefully. 11. 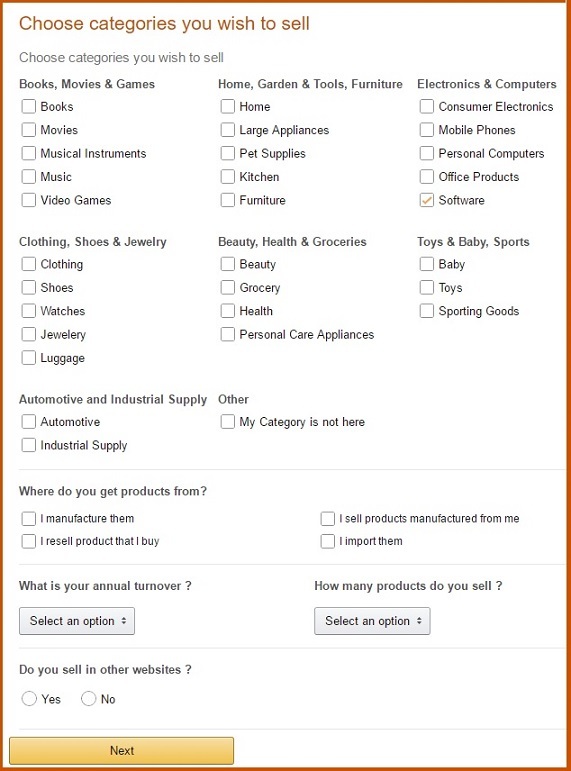 Next you need to select category of item you want to sell from given list. 12. at last move of listing, set your shipping rate and provide back detail. That’s it. You will soon get a call from Amazon to verify your collaboration with the company. 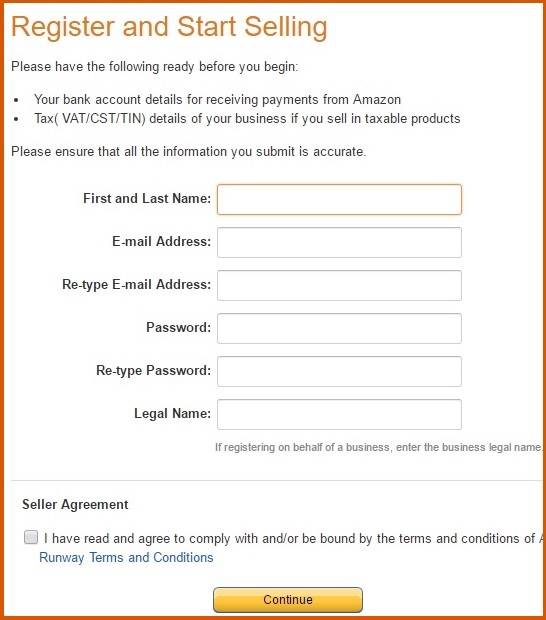 So, with these few simple steps, you can begin selling your products via Amazon. To begin with Amazon, your journey as a seller, you need to decide whether you want to sell goods as a professional seller or you want to be an individual vendor. It will be on the basis of your choice of category that you will be allowed to sell particular categories of products.